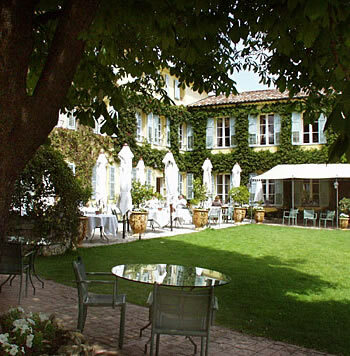 Hotel La Bastide Saint Antoine*****, Grass, France - GourmetVoyageurs.com. 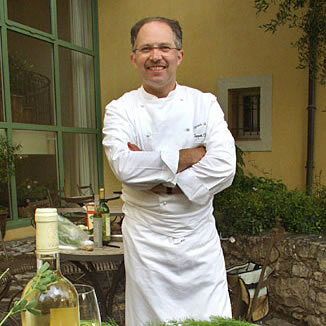 A Tranquil and Charming 4 star Country Provençal Hotel most famous for its restaurant "La Baside de Saint Antoine" Chef Jacques Chibois. This romantic, thoroughly Provençal 5-star luxury hotel is really just an excuse to avoid driving after eating some of the best food in France at the restaurant of master chef M. Jacques Chibois (1 Michelin star) with the same name as the hotel. While M. Chibois has worked real culinary magic for the Restaurant La Bastide Saint Antoine his wife, Odette, has used some magic of her own in styling the hotel and 9 lovely rooms and 7 suites set on 9+ acres of gardens and ancient olive groves. They have totally restored and enlarged this old eighteenth century "mas" which was in fact two separate buildings that they have joined together. They opened "La Bastide Saint Antoine" in 1996. During the last century, the former owner staged many fashionable evenings entertaining celebrities such as the Kennedy family and the Rolling Stones. Today, partly due to its proximity to Cannes, other famous people in the entertainment business frequent the establishment. With an amusing nod to their influence in the area, the Chibois's have chosen china for the dining room whose border is decorated with the names of all the winners of the Cannes Film Festival. On the back is a large photo of Marilyn Monroe. 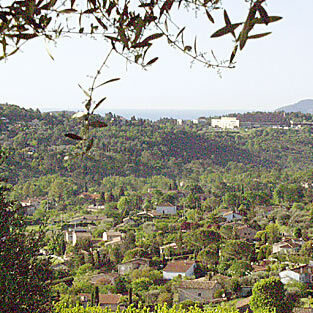 Set on acres of ancient olive groves whose trees are more than 400 years old, the property is on the outer edge of the town of Grasse, famous in the past for its production of perfume. It has a commanding view out over the Estérel and the Mediterranean waters of the bay of Théoule from the rooms and the terraces. The main buildings occupy a flat area, but as the hillside descends it is terraced and filled with more olive trees, flag stoned eating spaces and even a place to play "boules". Wild roses have adopted some of the olive trees and emeshed their vines into the branches and fill the tall trees with pink blossoms. Both the public rooms and the nine bedrooms and seven suites, just like the cuisine, evoke the themes of Provence. The soft colors, the terra cotta floor tiles from Salernes, the fabrics, the antiques and the traditional styled more recent furnishings all summon up the tastes of the area. 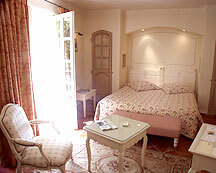 Even if the weather is not favorable for sitting on the terrace, the charming rooms inside are cozy and welcoming. From the minute you walk in and see opposite the reception the library with fireplace, bar and bookshelves filled with reading material in many languages, you really feel you can let down. In the one Michelin starred restaurant "Jacques Chibois", the four dining rooms give a more intimate feel to a restaurant that can seat up to 180 people for lunch or dinner. The bedrooms and the suites are also individualistic all displaying aspects of the regional charm. They are named after local villages in the area such as Opio, Peymeinade or Saint Vallier. The notice on the door to let the maid know to clean has a sachet of lavender attached to it and hangs from a hook rather than looping onto the door handle. Many of the rooms have fireplaces. The hotel and restaurant are open most of the year and it can get chilly in winter even by the coast. From the embroidered bedspreads and the eighteenth century terra cotta floors, the spacious bathrooms with baths and shower stalls with more shower heads than Medusa not to mention the latest wide screen TVs and stereo equipment with CNN, Sky News and other stations from all over Europe, not to forget the wifi throughout, iPod dock, the rooms offer very comfortable accommodations to sink into after one or more meals from the kitchens of M. Chibois. There is a lot to do in the area from sports to nature trails; from shopping visiting wineries. The hotel has made it their business to have a full dossier of information for whatever you may want to do.